With the lack of brick-and-mortar casinos in South Carolina and very few floating casinos available, licensed offshore online casinos are a viable alternative that is legally available to the state’s residents and visitors. Multiple licensed and regulated offshore casinos serve South Carolina residents but the challenge of deciphering which destinations are both legal and safe to use is why we crafted this page. This page will inform SC residents about legally sanctioned casino gambling opportunities available in SC, how offshore online casinos function, the legalities involved, and what players can expect to find when using an online casino. Is Online Casino Gambling Legal In South Carolina? Yes, but at this time, it is only legally available through licensed offshore sites which serve the United States. As long as the offshore vendor is licensed and regulated, players are not breaking any South Carolina gambling laws. South Carolina currently does not have any brick and mortar casinos or state-regulated online casino sites to offer residents and there have not been many attempts to introduce legislation to do so either. Does South Carolina Have Brick-And-Mortar Gambling Options? The only brick-and-mortar gambling sources in the state are through riverboat casinos. The Big M riverboat has over 400 different slots to choose from between two boats. They also host table games such as blackjack, craps, roulette, three-card poker, and Let it Ride. However, no land-based casinos exist in the state. Are There Any Tribal Owned Casinos In The State? South Carolina lacks any tribal-owned brick-and-mortar casino operations. The Catawba tribe is the only legally recognized tribe in the state. They attempted to introduce land-based bingo and casino gambling back in 2006 but were shut down by the SC Supreme Court a year later. In the 1990s, thousands of video poker machines began to pop up throughout the state. This did not sit well with the government and the SC Supreme Court shut down over 30,000 video poker machines in 2000. From then on, gambling laws have gotten more restrictive in the state. 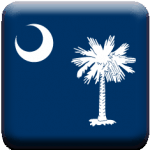 Has South Carolina Put Out Any Legislation Regarding Online Casinos? South Carolina has yet to pass any state laws introducing legal online casino options. The state has had the option since 2011, but the conservative lawmakers in the state have reeled back on any type of ambitious legislation that would bring in this type of gambling to the state. Where Can South Carolina Players Find Mobile Casinos? At the moment there are no domestic offerings available to SC players, however, licensed offshore online casinos willingly accept players from South Carolina and provide them with mobile playing options. These licensed offshore online casinos can be utilized through a player’s mobile browser on either iOS, Android, Windows, or Blackberry device and are completely legal for SC players to enjoy. These licensed offshore online casinos translate their numerous game titles and variations, promotions, and more directly to mobile screens to allow players to take their games wherever they go. Has South Carolina Attempted To Develop Any Commercial Casinos? In 2015, Todd Rutherford, a representative for the Palmetto State, filed a bill that would have seen the first set of commercial casinos to be built. Unfortunately, the bill did not pass through the South Carolina House. In July 2014, a poll was disbursed amongst the voters of South Carolina. When asked whether they would be in favor of or oppose state-run online gambling, 68% of voters were against the notion. This does not bode well for possible expansion into the domestic online gambling realm. When Did South Carolina Become So Harsh Towards Gambling? South Carolina’s gambling laws are a bit archaic in the sense that they have been around since the end of the 19th century. State Code 11-19-1 was passed in 1802 and essentially banned all forms of gambling in South Carolina. Not much effort has been put into changing the narrative surrounding gambling since these laws were introduced. Do Offshore Casinos Offer Bonuses? Yes, nearly all licensed offshore casinos have bonuses for players. These bonuses give SC residents more money to gamble with through additional bonus funds. The most common bonus form is a welcome bonus or match bonus which is where an online casino matches the player’s deposit by a set percentage. You can also find bonuses for live dealer games, mobile play, and game specific bonuses. Other popular services including SC online bingo, SC online poker, and SC online sportsbooks also have numerous bonus options qualified players can choose from. What Types Of Games Do Licensed Offshore Casinos Offer? Licensed offshore casinos have a lot of what you would expect to find in a traditional brick-and-mortar casino. They have different variations and game titles available to play within each game category: slots, blackjack, roulette, baccarat, video poker, card games, and specialty games like keno and bingo.